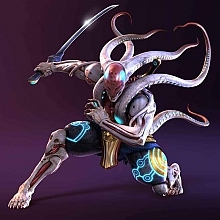 I was just wondering if you're interested in step-by-step Yoshimitsu DR guide. I can write the articles in the Manji Dojo for all of you who don't have much time to read the extensive Tekken 5.0 FAQ. I'll cover there most important aspects on which you'll have to focus while playing Yoshi, and maybe upload some tutorial videos...? I'd be very interested, I was late getting tk dr anyway. By the way In your special move video, I'd like to know how you did that flash backwards, I deliberately look for glitchs in tekken and I still haven't worked out how you did that. @ Tenshi: I'm a bit in the middle about this guide, on one hand it's a good idea because people are still playing DR online and are still going to tournaments. But the only downside is that despite loads of people are still playing DR online, some people are just sitting around and waiting for Tekken 6. I leave the decision up to you Tenshi you are the boss and you know what's best for us all and you have my support 110% whatever decision you make. Fastlegs of Fury : @ Tenshi: I'm a bit in the middle about this guide, on one hand it's a good idea because people are still playing DR online and are still going to tournaments.